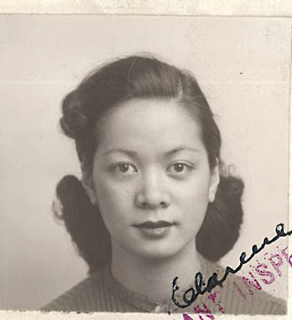 “Form 430 Photo of Lee Wun Jun (Mable June Lee),“ 1939, Chinese Exclusion Act case files, RG 85, National Archives-Seattle, Lee Wun Jun case file, Portland Box 100, 5017/891. Mable June Lee, a princess for the 1939 Oregon Winter Sports Carnival, was applying to leave Portland to publicize Oregon and Mount Hood in Mexico. She and the royal court traveled to Nogales, Arizona, then spent five days in Mexico City and returned via El Paso, TX. The trip was made by train and would take three weeks. Mable was 21 years old and born in Portland. She was a checker at the Orange Lantern Tea Room in Portland. Mable’s brother, Lee Shear Nuey, also known as Louis Lee, was a witness for her. Their parents were both dead and were buried River View Cemetery in Portland. According to C. J. Wise, the examining inspector, Lee spoke English perfectly. Lee did not know much about his grandparents; they had all died in China many years ago. Besides Mable he had two sisters and three brothers: Lee Lin (Mrs. Chin Chow), Lee Tai Hai (died of the flu in Portland in 1919 and buried in the Lone Fir Cemetery), Lee Tommy Shear Gong (born on the boat crossing from China about 1914 on his parents’ one visit to China. He was now living in Stockton, CA), Lee Shear Gum, a chef at Green Mill in Portland and another brother living in Cuba. Lee Lin, Mable’s older sister, was also a witness for her. Lee Lin was born in San Francisco in 1894. She was married to Chin Chow and they had seven children—two boys and five girls. Her daughter Dorothy Chin Kum was adopted out to Mrs. Sing Ho. She also had a daughter, Ah Me, who died of the flu. 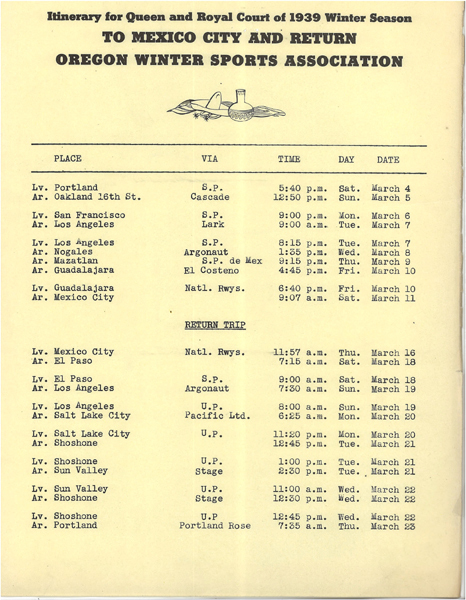 Mable’s file includes a certified copy of her birth certificate and her itinerary for her trip to Mexico City. 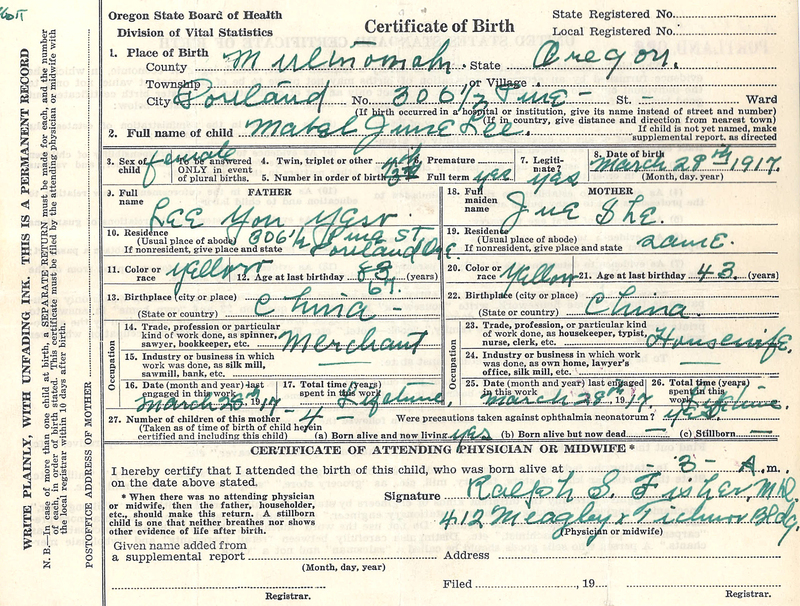 “1917 Oregon Birth Certificate for Mabel [sic] June Lee & 1939 Itinerary for Oregon Winter Sports Association ,“ Chinese Exclusion Act case files, RG 85, National Archives-Seattle, Lee Wun Jun case file, Portland Box 100, 5017/891. According to an article [not included in the file] in the Oregonian on 25 February 1939, the royal court consisted of Queen Fern Lorenzini, Crown Princess, Dorothy Olivera; and princesses: Norma Cowling, Maryanne Hill, Mable Jean Lee and June Long.